The big news for me this week is that I will be taking over the Swatch to Sweater correspondence course. This course was developed in 2009 but the instructor can no longer continue. I am quite excited. I will be guiding the student through the process of designing a sweater. I am making some changes to the course to give the student some choices during the design process and I am rewriting the handout to make it more of a lasting reference guide. Students may sign up starting May 1st. I didn't get a single lesson to review this week which turned out to be a good thing. I spent the first part of the week in Las Vegas at a family reunion. I also was celebrating finishing the Decoration Day sweater and the handout for the finishing class. Actually I was honing my gambling skills in preparation for the conference in Reno. I'm glad to report I did pretty well. Hope I have the same luck in September! Keep those lessons coming! If you are finding something that has got you stumped, please let me know. No silent suffering! The biggest problem people seem to have with this technique is identifying the path of the yarn. 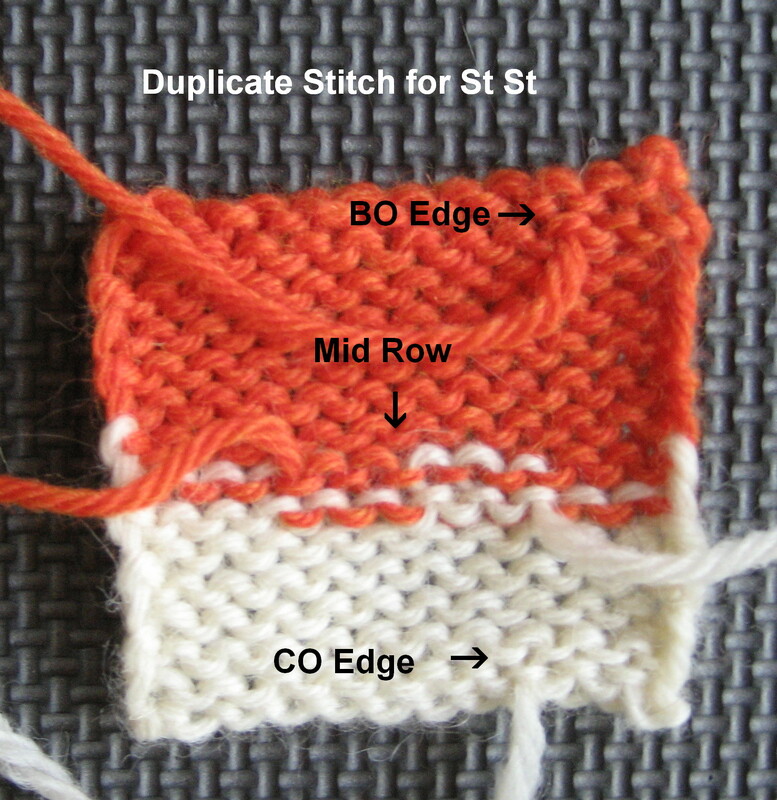 The duplicate stitch should follow the stitches on one row. This is easy to see for reverse stockinette where the WS is stockinette stitch but it can be difficult to see where stockinette stitch is the RS and reverse stockinette is the WS. What I decided to do is to knit a swatch with much larger needles than you would generally use (I used Size 11) and work one row in a different color. You can clearly see the path of the yarn. The orange yarn shows you the path of the yarn you need to "duplicate." 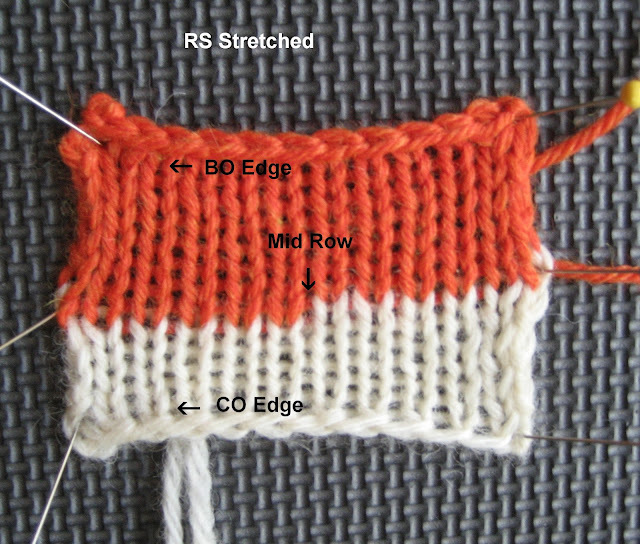 What I have learned over the years is that if you run your tapestry needle completely under the stitches in the rows above and below, it can be visible on the RS. 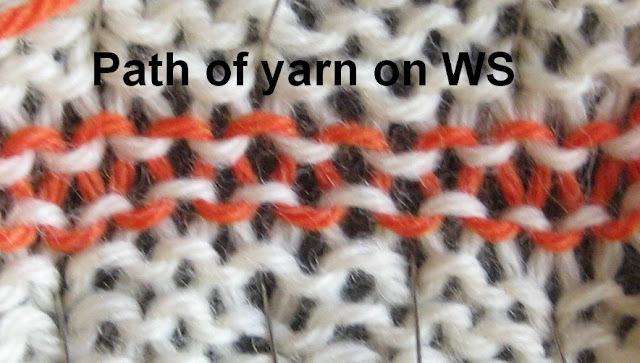 What you want to do is slightly split those stitches to keep the tails on the WS. You want to weave in enough of the tail so that it cannot pull free. Trim the tail close to the stitch. I have not trimmed the tails in the photographs which follow to make the location for the weaving in easier to see. The photograph shows the CO and BO yarn tails as well as a mid-row join. When you have finished weaving in the yarn tails, don't cut the tails until you look at the RS. Stretch the piece horizontally. The tails should not be visible and they should stretch the same as the surrounding stitches. If you can see them, redo them. The photograph which follows shows the swatch stretched. 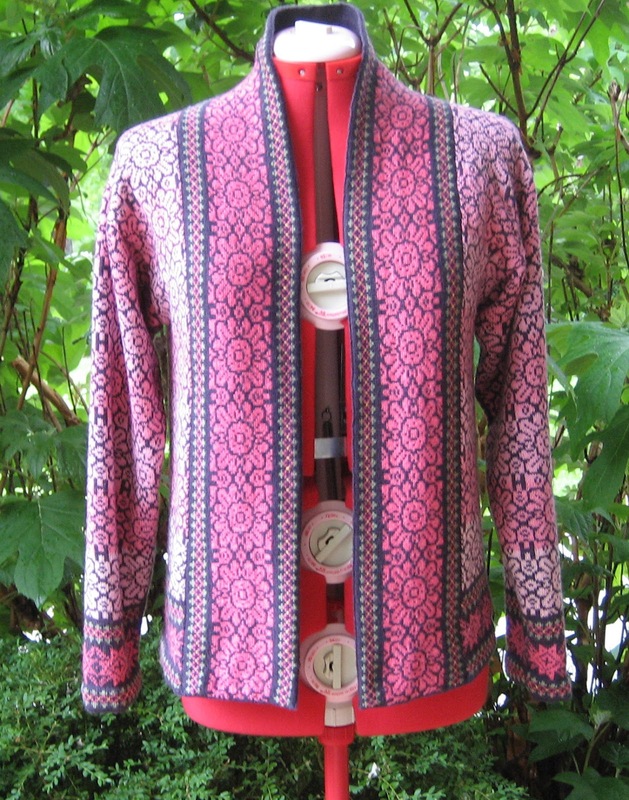 The weaving in is not visible. Also notice at the mid row join, the white and the orange stitches are the same size. This video Weaving in Yarn Tails in St St shows how to accomplish this. 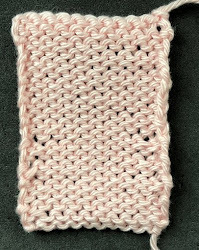 In the Masters Program, one of the swatches in Level 1 tests this skill but yarn tails should be woven in correctly in all of the swatches in all of the levels. Weaving in yarn tails is never much fun but it is one of those details that can make a garment look homemade rather than hand made. I had several requests to have the salon on Sunday so it will be on April 29th from 2-5pm. I finally finished the Decoration Day sweater. As with any stranded sweater, there were lots of ends to weave in and the front and bottom bands had to be hemmed NEATLY. That took several days. I am very happy with how it turned out and I know my mother would be thrilled. On my walk today I passed a house that had black irises and pink peonies in their yard and I am happy to say, Elf at Redfish got the colors dead on. 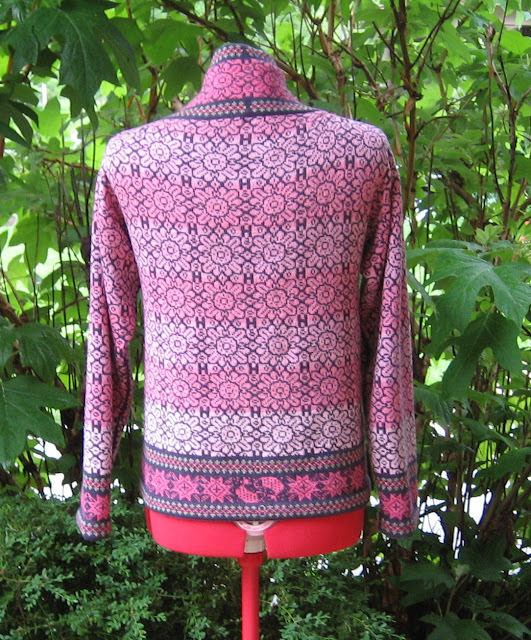 I am more proud of the fact that I did the pattern as soon as I finished the sweater. So far, I have kept my New Year's Resolution. I still have one more sweater for the Fall issue of Cast On to do. I only have a few inches left to do on the back. I love this stitch pattern. The top of the cables are wrapped. I'm hoping to finish up the back and get a good start on the front this week. Wow, stunning sweater. I was sitting in the TKGA booth at Stitches West talking with someone when you came by with your bag of yarn for this. I hope it's cool enough in Reno to see you wearing it!